Think of how much energy and money you can save by not having to pay for lights running all night long, every night! Each light has a small solar panel that absorbs energy from the sun during the day and converts that energy to stored electricity in rechargeable a battery to be used at night. Many of the outdoor solar lights have a timer on them to automatically come on at when it gets dark, making them very convenient and easy to use. These solar lights use LED (light emitting diode) lamps. These lights last longer because there is no filament in them and they don’t waste energy by giving off heat. Most of these lights have multiple LED’s and have a reflector inside to give off maximum light and to distribute the light evenly. How long will my lights run at night? That depends on several factors including amount of daytime sunlight exposure. Obviously the more sunlight the light receives the longer it will run. So seek areas with plenty of open sunlight. Be sure the solar panel on top of the light is facing south to southwest to get the greatest exposure to the sunlight. With an exposure of around 8 hours to the sun, many lights can run 12-15 hours. Also take into consideration any shading of the area that may occur during the day from nearby trees, bushes, buildings or the like, as they will diminish the light output. Other factors affecting the level and length of run time on the lights. The geographic location can affect the intensity of the light and the length of the run time as some locations will receive less hours of sunlight and with less intensity. The time of season can also have a bearing for the same reason. Solar landscape lights will tend to be not quite as bright as your typical outdoor lighting; however this can be a benefit if you are looking to create more of a mood in your garden, patio or around the pool. Saves you money since they cost nothing to run. 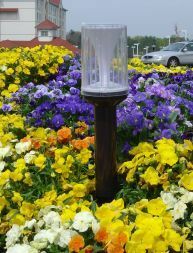 You can use solar garden lighting and solar yard lights where standard lighting would be expensive or impossible to use. No wiring hassles, saving additional money. Up to 1000 nights of lighting with a single rechargeable, replaceable battery. Outdoor solar lighting has led lights that are energy efficient, give off little heat, and emit no greenhouse pollution. Solar patio lights are very stylish- ranging from the classic traditional style to a cool contemporary designer look. Many of the lights come with a choice of colors that will be illuminated from white, blue, amber, green and red. As you can see there are many different options you have and benefits to using solar lighting. Explore below the many different ways that you can use your outdoor solar lights to save money while helping to contributing to a cleaner environment. Return from outdoor solar lights to solar energy scene home. Solar Yard Lights Click Here. Solar Shed Light Click Here. Solar Deck Lights Click Here. Solar Step Lights Click Here.